TS PGECET 2017 Notification| TS PGECET 2017 Apply online at pgecet.tsche.ac.in| Post Graduate Common Entrance Test of Telangana State Admission Notification 2017| TS PGECET 2017 Application Form, eligibility , Exam dates ,pattern admit Card and Result| TS PGECET is the Post Graduate Common Entrance Test of Telangana State. 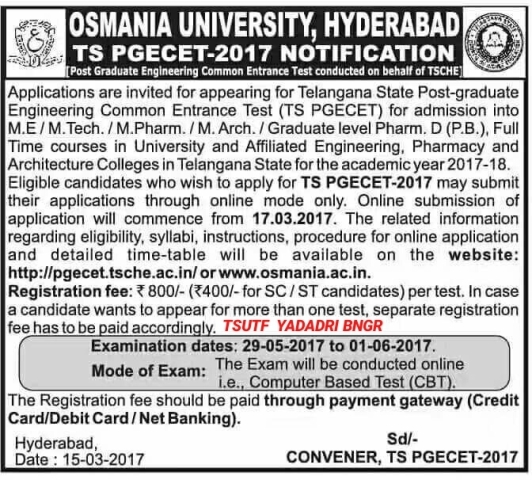 The exam is conducted by the Osmania University on behalf of Telangana State Council of Higher Education (TSCHE). TS PGECET is organised for admission to the first year postgraduate courses in Engeneering ,technology,architecture,pharmacy and planning .It is the state level entrance exam.